For a candidate in today’s job market, the options are almost unlimited. 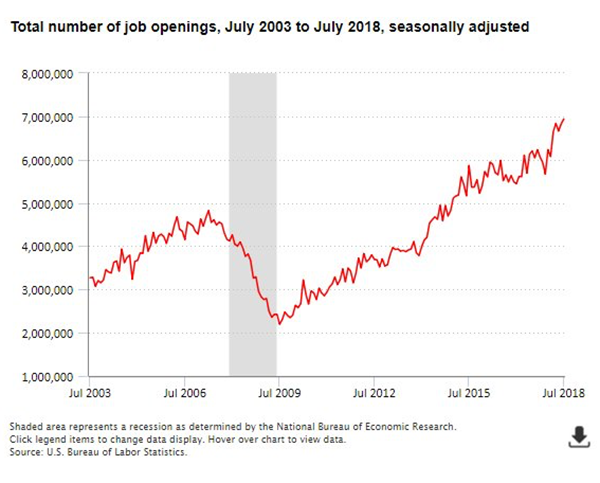 At 3.7%, the national unemployment rate is the lowest it’s been in forty years and the United States Bureau of Labor Statistics found the total number of job openings increased by almost 4 million in the last 15 years. Zooming in specifically on the financial services industry, The Washington Post reports that 111,000 jobs were added from August 2017 to August 2018. Individuals looking for jobs in the financial services industry today do not have to look far for a good choice. They may even have more than one. Recruiters need a deep rolodex of relationships to be successful in today’s business. For a single search, our team may reach out to anywhere from 100 to 250 prospects. But because these individuals have so many opportunities, even a deep rolodex may not make a difference. Getting through to candidates has only become more difficult. A recruiter must convince the candidate of their strong relationships and ability to get them in front of the right people. Recruiters are the liaison between candidates with a variety of choices and clients whose number one focus may not be the hiring process. The recruiter must remind both candidate and client how time sensitive each situation is and establish clear, efficient communication patterns from the start. There is a delicate balance to be attained between the needs of the client and the realities of today’s employment market for a candidate: if not this job, another one. Because a recruiter may source over 100 qualified candidates who are interested in an opportunity but only send the top 10 for consideration, they need to earn the client’s trust. This means finding quality candidates and efficiently sending them in for interviews. Over time, the recruiter will prove they are running a deep and thorough process to find and place the best talent. Clients need to stay on top of their game. In order to keep prospects interested, attentiveness to the hiring process is no longer something a company can delay, but something they must prioritize. The client needs to run a smooth, systematic process on their end and be ready to move on the right person when they see them. They also need to offer competitive compensation packages. The numbers speak for themselves. First year investment banking analysts are making a base salary between $85,000 and $95,000 per year with a 60%+ bonus. Buy-side professionals with 4+ years of experience are looking at compensation packages upwards of $350,000 and payouts for Portfolio Managers are at all-time highs as well, reaching percentages in the high teens to low twenties. While a candidate may never admit it, salary will frequently be a deciding factor in their decision. Culture will play a part as well. Clients need to have a great reputation, meet the needs of discerning candidates, and provide the best value proposition. A client must emphasize to the candidate why they are different. They need to subtly boast about why their culture and performance make their company a great place to work for more reasons than money. As one of our Long Ridge recruiters recently said, “It’s very rare we have a candidate without an offer from a competing firm on the table.” A client must prioritize culture and compensation or miss out to a company who does. In any job market, a candidate needs to give the interview process every ounce of energy possible. Even in a healthy economy where choices abound, there will still be a number of qualified people vying for the same job. A candidate needs to find a way to outshine them. The interview is a great opportunity for a candidate to show the right skill set, unique personality, and the grit, determination, and hard work they are excited to put forth in the role. Landing the first choice is not a guarantee; however, if candidates give the process everything they have, chances are they will end up somewhere they are excited to be. Clients must strengthen retention. Even as they hire fresh talent, cultivating a positive culture will be necessary to keep their employees around. Dan Schawbel suggests in this article for Fortune magazine the following strategies to entice people to stay: career mobility, flexibility, learning opportunities, and good compensation. A healthy economy has turned the slow months into active ones, keeping everyone, from recruiters to candidates to the companies who hire them, on their toes and ready to go.